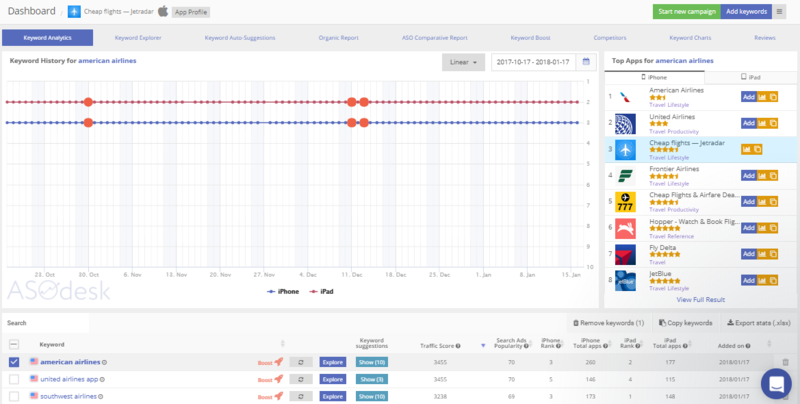 You may already be familiar with the App Store Optimization function. This system has allowed many users to increase the number of downloads of their app from the App Store and Google Play store, while improving the conversion rate of the application page. One particular aspect of the App Store Optimization function worth discussing is the correct preparation of a semantic core. This will aid you in finding numerous targeted search requests for your application, increasing inflow of users from the App Store search and Google Play store several times over! Despite the method of finding the target of searches being relatively simple, few mobile application developers have done this so far. What is the semantic core of mobile applications? A semantic core is a set of words and phrases that best describe the applications functionality and user issues solved by the application. To put it simply — it is a set of words or phrases that your target users might use to search for your mobile app. A semantic core allows you to build the most accurate picture of the needs of your target audience. Knowing their requirements, you will be better able to understand how your users search for your app and return their exact search requests. An interesting fact: about 70% of search requests are “long” requests that include more than one word. That is to say, your users may search for “work in Moscow” or “paid job” etc. as opposed to just “work”. How to build the most complete semantic core? To build a semantic core, you need to understand how your users search for your application. To do this, you need common sense and a few basic tools. If your application has not yet appeared on the market and you’re just about to release it, it would be a good idea to sit down with your team and discuss search requests that meet the functionality of your application. For example, if your application is a flight booking agregator, your search requests will be “cheap”, “flight search”, “plane tickets” and so on. If your application is already on the market, you can still optimize your application’s search visibility by analyzing customer responses to your application. For example, the iOS Duolingo app can receive reviews such as: “English training” and “Training of English”. Note: customer reviews and user surveys are the most effective ways of improving targeted search requests. It is extremely important to analyze your competitors. You need to understand what search terms your competitors use for search requests optimization. Look at the names of your competitors. The name may be hidden in a lot of targeted search requests. For example, the name of “Flo application” is clearly optimized for terms such as “flower delivery”, “send flowers”, “florist”, “flowers in Moscow” and so on. Study and learn from competitors’ reviews the same way you would your own feedback. The more requests you collect in this first stage, the higher the quality of your semantic core in the end! At the end of the first stage, you should have a list of a few dozen keywords and phrases, but this still cannot be called a high-quality semantic core. It is possible that this core does not include any search terms that your target users might use. There is a huge database of synonyms and examples of the usage of words on the internet that is constantly updated by users..
For example: WordNet can be used to search for synonyms in English. Its database is regularly refreshed under the direction of Princeton University and its API is simple to use. In addition, there are similar web pages for synonyms in other languages. It is also useful to investigate examples using an online dictionary. This service is useful because they can provide information regarding popular and related searches from across the web. You can also display statistics on separate mobile devices. It is recommended that you research every meaningful keyword to maximise the effectiveness of such a system. After completing all of the above steps, you will have acquired a list of several dozen, or even hundreds of search words and phrases. It is likely that you will be able to use many of these terms when optimizing your application. In the App Store keywords section, you are given only 100 characters, including commas. Words can be used in the name of the application, however, not every name may be accepted by the App Store moderators. On Google Play, there is no limit to the number of keywords. The search engine indexes the description of the application, but as the description must be readable for the user, inputting a large number of keywords can lower your installation conversion. Despite using a particular word or phrase, your application could have a low ranking position and this will not give you an advantage in the application settings. Your target audience might not often use a particular word so the word will generate only a small amount of traffic. How do you know whether there is traffic on the search word or not? Where can I get statistics on the word or phrase for the App Store and Google Play? You need to use the assistance of services such as ASOdesk.com Our platform provides accurate data regarding keywords, including: keyword suggestions, daily number of users per keyword, current position of your app in search results, number of competitors using this keyword. Traffic data is extremely accurate, and should be enough to help you make the correct decisions when optimizing your semantic core. 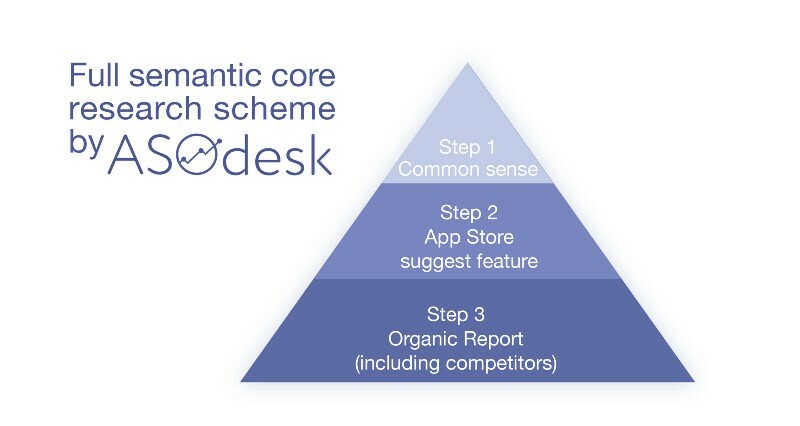 The development of a semantic core can help attract target users to your app for free. Users will find you by themselves. Moreover, such users will be of the “highest quality”, as these people have certain needs that your application will be able to satisfy effectively.